Snakes - Animal Wonders Inc.
Don't judge us by our reputation. Snakes are thought to be slimy and have a bad reputation for being evil. Once you meet and understand a snake you will see that they are very misunderstood. Snakes have scales just like all reptiles. They are smooth, sleek, and beautiful. They are different from lizards because they have no external ears, they only hear vibrations. And they have no eyelids, they have a clear layer of skin over their eye. Snakes move by flexing their muscles along their long flexible bodies. Meet Animal Wonders' snake residents. Click on their picture to see their biography. 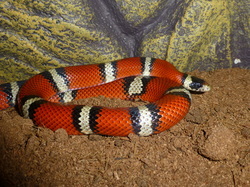 Sinaloan Milksnake (Lampropeltis triagulum sinaloae). These milksnakes are found in southwest Mexico. They resemble the coral snake because of their bright stipes of color. They are not poisonous but mimic the venemous coral snake to scare away any predators that want to have them for lunch. There is a saying to follow this form of mimicry. It goes: Red on Black friend of Jack, Red on Yellow kill a fellow. Meaning that if the red stripes touch the black stripes they are not poisonous. Milksnakes got their name because they were often found in barns. People thought they were drinking milk fromt he cow's udders. The snakes were not drinking the cow's milk but were most likely in the barn looking for their next meal of mouse. Red-tailed Boa (Boa constrictor). These snakes can grow up to 10 feet in length! They are named for the red-brown color of the pattern on their tail. These snakes are incredibly strong. Like all snakes, their body is made of many muscles that help them move and constrict their prey. 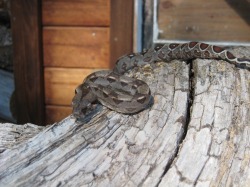 Red-tailed boas eat small to medium mammals. They strike their prey and then wind their body around it squeezing the air out of the animal. Every time the prey exhales they constrict a little more, eventually suffocating the prey. Ball Python (Python regius). These docile snakes are found in grassland, savannahs, and sparsely wooded forests of Africa. They can grow to a bulky 5-6 feet. They get their name from their defensive maneuver of winding their body into a tight ball with their head inside the folds. Ball pythons are commonly kept as pets due to their calm personality. Corn Snake (Pantherophis guttata). 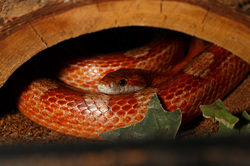 Corn snakes got their name years ago when farmers used to find them in their grain silos. At first they thought they were eating their grain, but soon realized they were eating the mice who were eating the grain. Thus, corn snakes were very helpful to the farmers. Corn snakes come in many different colors. They have been bred much like the parakeet to give diverse colors and patterns. They make very good pets because of their calm docile characteristics and low maintenance care. 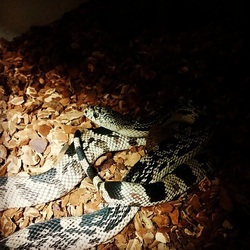 Pine snake (Pituophis melanoleucus). Pine snakes are found in north eastern North America. They can easily be mistaken for a rattlesnake due to their color and pattern and when threatened they shake their tail making them look and sound like the venomous rattlesnake. However, pine snakes are not venomous and are necessary for a healthy ecosystem. They prey on small rodents and keep their populations in check. If there were no snakes the area would be overrun with rodents which would eat all of the seeds and further causing distress on the ecosystem. 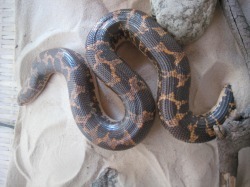 Sand Boa (Gongylophis colubrinus). These snakes are found in the deserts of Kenya, Africa. They live under the sand and only come out to ambush their prey. They have a special hard "shovel" shaped nose that allows them to push through the sand at ease. They hide out of sight with only the tip of their head above the sand. They taste the air with their tongue for scents of possible prey. Once the prey gets close enough, the sand boa strikes the surprised prey. Snakes don't chew their food. Instead they swallow it whole, head first. They are able to swallow something bigger than their head. They have a flexible lower jaw that allows them to do this. If we could do that we could eat a watermelon whole! Western Hognose snake (Heterodon nasicus). The Hognose snake is a very interesting and unusual snake. They have a very distinct upturned nose that looks like a pig's, which is why they are called a hognose snake. They live in the United States and northern Mexico and can be found right here in Montana, though sighting are fairly rare. Hognose snakes are interesting because if they are threatened, instead of hissing and striking, they roll on their backs and play dead. They will even stick out their tongue and release a foul smell like they have gone rotten. They will keep and eye on their attacker and watch them leave. As soon as the danger has gone they roll back over and go along their way.